This challenge really pushed me to rethink how I approach cardmaking. I saw the color challenge, had ideas of what I wanted to do but once I started the card...it went a whole new direction. The crocheted flower on the sweater inspired me to retrieve my crochet thread and hook and revive a skill or should I say project that has meant so much to me in the past. This is the creation I came up with and I am really pleased. thank you! 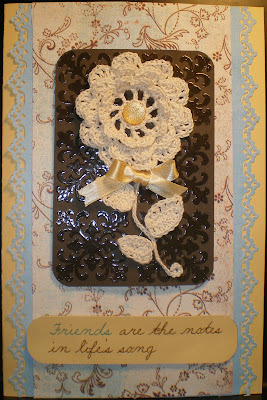 I Loved the crochet flower! LOVE LOVE LOVE the cards. Did you crochet the flower yourself?? LOVE LOVE LOVE The card! Did you crochet that flower yourself? AWESOME job! OOOH Hunny I keep on coming here to look at the beautiful job you did!!! LOve it! Can you share the pattern you used or indicate where you found it?